Happy New Year!!!!! First week of 2016 is here and I’m loving it!! How about you? I made all kind of goals last year and I’m actually kinda shocked that I accomplished all of them EXCEPT losing this doggone muffin top!!! Ugh!! Why does fat and sugar have to taste so good!! Well this year I was so determined to get rid of this flabby gut that I started in the middle of December. Ya see…I had this AHA Moment on Dec. 10th when I finally checked out my families Disney pictures. We took lots of family pics during our vacation and they all showed my baby bump! But there’s just one problem. I’m not pregnant!! Nothing like a candid photo of yourself to whip you into shape, huh? My muffin top had turned into a daggum loaf of bread!! How and when did that happen? I immediately started working on it as soon as I got home. I was fed up of being the non-pregnant, pregnant girl! I felt sluggish, heavy, and bloated. Something HAD to change and so I DID!! What I needed was nature’s weight loss pills AKA a good ol natural detoxing! I’ve started to really become interested in holistic remedies and detoxing. My family actually visit holistic chiropractors instead of regular doctors simply because I’ve witnessed the power of natural medicine many times. I honestly think they are the most affective in actually healing the body and not just covering stuff up. No shade to doctors. Just saying. Many chiropractors believe in using detox meals for various conditions including weight loss. I stumbled across a post about detoxing fruits and vegetables and how eating a rainbow of vegetables was the best way to detox and cleanse the entire body. Easy enough right? I went shopping for some colorful vegetables that were said to “detox the body” and the rest was history. Detoxing is now a part of my daily lifestyle. Just within two weeks I’ve been steadily shedding weight and excess water, my skin is fab, I have so much energy and I didn’t have to give up my favorite foods completely. Seriously, I feel like I’m cheating! Why didn’t you guys tell me about detoxing meals years ago????? I know y’all knew. You guys always know everything! Detoxing is nothing new, but it’s totally new to me when it comes to losing weight with detoxing. I simply started replacing one of my meals with a detox soup, salad or smoothie! (I’ll be posting those recipe too!) I did a few other things as well and I’ll list that below. 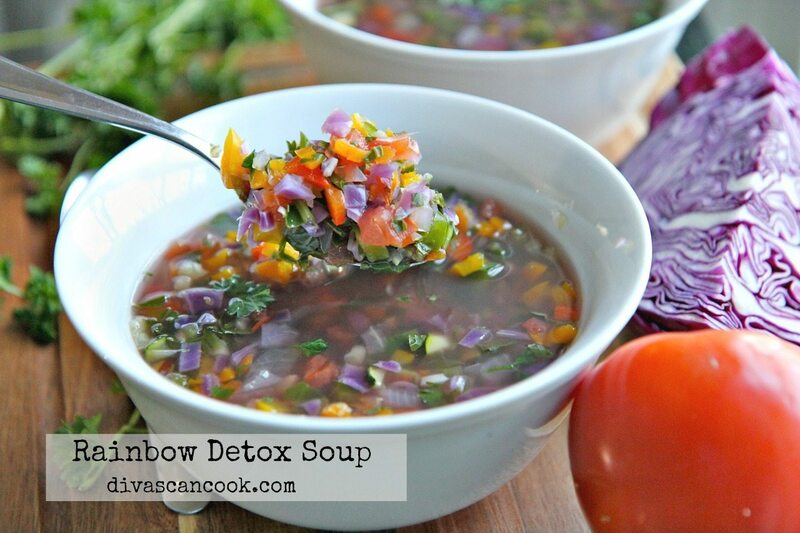 But first let’s talk about this rainbow detox soup!! Is it good? Um…not really. Does it work? OMG yes!! It’s a very simple soup to make and it’s easy to swap out veggies that you don’t like with other detoxing veggies from the list. 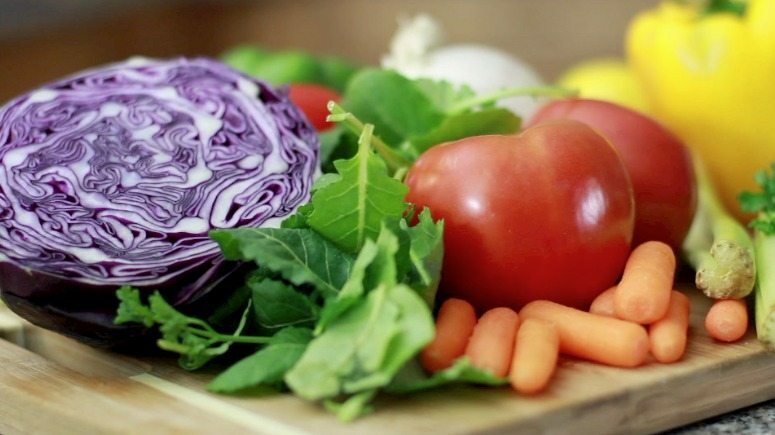 Here’s a list of the best detoxing veggies. Let me know if I need to add more to the list. 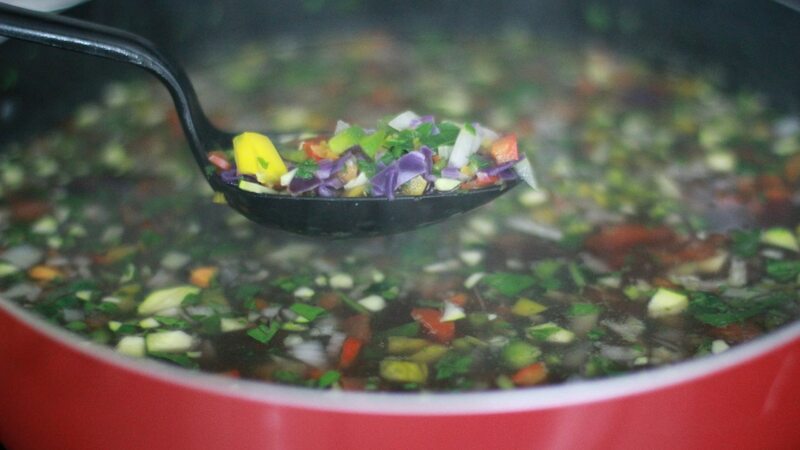 This detoxing soup is full of a rainbow of different vegetables that helps rid the body of toxins, speed up that sluggish digestive system and blast bloating in it’s tracks! I love it …. and I hate it! When I first started on this soup I used water since I read you should aways detox with purified water or green tea. I couldn’t even swallow the daggum stuff. It just tasted like…. dirt! Sooooo I replaced the water with natural, msg-free chicken broth and a bit of cayenne. Bernando LaPallo uses it in his Barley Soup and he’s 114 and swears by it!! Good enough for me! Using broth helped a great deal with flavor and I don’t think it really affected the detox process too much because I started seeing results with in a couple days. Just don’t go in expecting to partake is a delicious, flavorful bowl of soup and you’ll be good to go. What motivates me is that I can have whatever I want for breakfast and dinner (within reason and proportion of course). To my surprise he thought it tasted good for what it was, a detoxing soup. 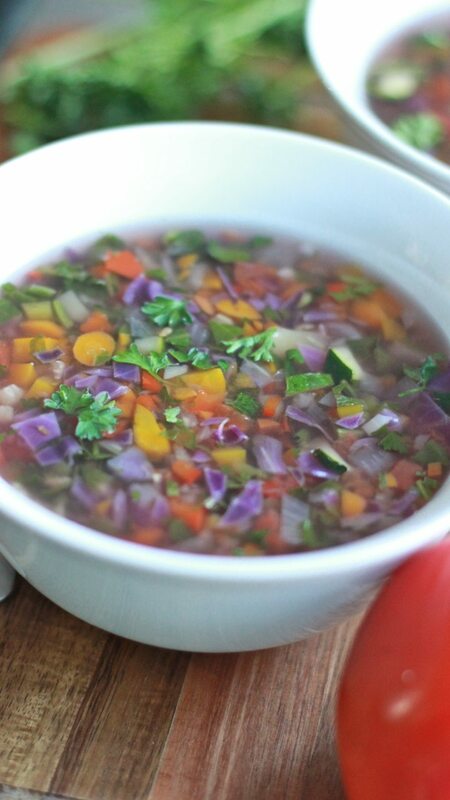 Looking for a more flavorful detox soup? Try my cabbage soup recipe! It doesn’t give me results as fast as this soup does (darn!) but it’s so delicious!! I woke up on the 3rd day and my skin was so clear! I just looked “fresh faced” and I felt light. Dark circles under eyes have lightened up. I’m not sure what’s in this soup that helps the skin but something in it is totally lighting up my under eye circles. I hear a slow digestive system will cause dark under eye circles and this soup is suppose to speed that up so maybe that is it. Not sure. By day 4 my stomach was much smaller even by the end of the day when it’s usually bloated and heavy feeling. For the last two weeks I’ve been alternating between this soup, detox salad (made from the detox list above with olive oil dressing) and my detox apple cider smoothie (recipe coming up). I honestly think any detox meal will work in conjunction with other small lifestyle changes. Perhaps that’s why I like this so much. It’s a lifestyle change that I can handle. I’m a foodie by heart and most diets/lifestlye changes require too much “giving up stuff” to get results. I’ve pretty much kept my diet the same. Here’s the 5 things I did to pretty much blast away my muffin top! 1.) Started oil pulling with coconut oil- I’ve always oil pulled off and on but never with coconut oil. This really curbs the appetite and cleanses the body when done first thing in the morning before you put anything else in your stomach. It’s pretty awesome. Just take a tablespoon of organic coconut oil, swish it around in your mouth for 20 minutes and then spit it out in the toilet. Rinse your mouth and brush your teeth afterwards. 2.) Coconut oil- Ingest 2-3 teaspoons of organic coconut oil everyday. I mix mine in salads, soups, or spread it on toast. Sometimes I just swallow it plain. 3.) Cleaned up my morning coffee- I drink coffee EVERY. SINGLE. MORNING. I’ve done so for the last 2 years. The healthier thing to do would probably be to replace it with green tea but I’m sorry, green tea and coffee just aren’t on the same level of awesomeness. Normally I load my coffee with lots of white sugar and cream! Now I use almond milk to make it creamy and agave or coconut syrup to make it a bit sweeter. It love this! 3.) DETOX food and plenty of water!! !- This has worked wonders for me! I simply replace one meal a day with a detox soup, salad or smoothie. Be sure to drink plenty of water since detoxing MUST have water! If not you’ll get seriously constipated. Be prepared to pee and poop! 5.) Cut back on white sugar, white breads and dairy- Cutting down on my sugar intake and white bread has really help me overcome my insatiable cravings for sugary foods (my ultimate weakness). I still eat it but not nearly as much because I seriously don’t crave it every single minute like I use to. I use agave, honey or coconut oil to sweetened things up. Stay tuned for my before and after results at the end of the month! 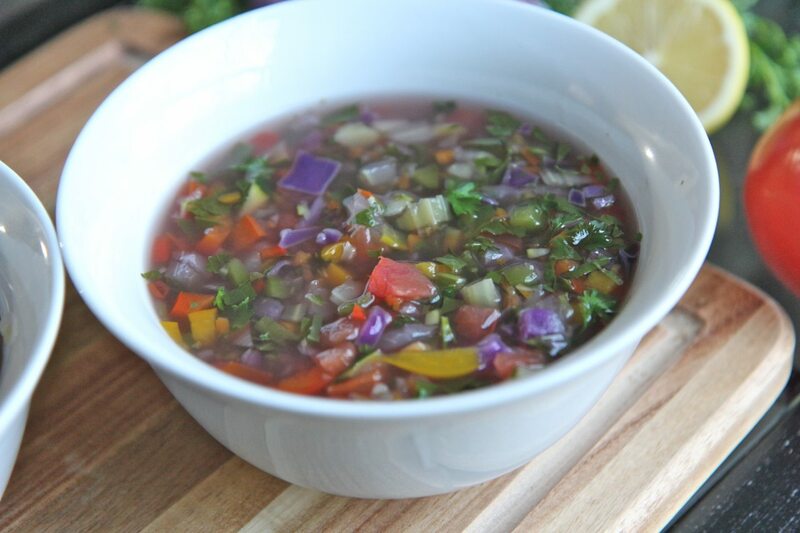 Watch me make this rainbow detox soup from start to finish! Add chicken broth to a large pot. Serve with a sprinkling of cayenne and a splash of lime or lemon juice if desire. 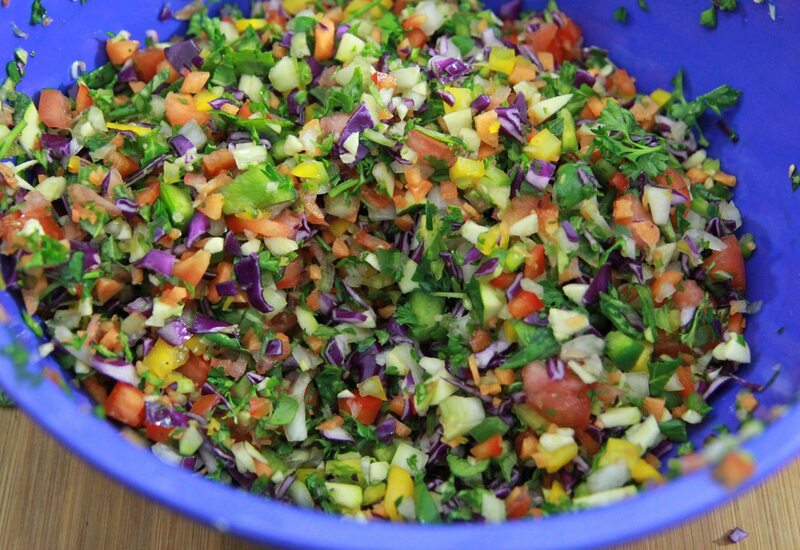 Can also add sliced avocado and a bit of coconut oil to your bowl when ready to serve. This really helps keep you full until dinner time. No difference from what she said to do.